Please send a letter asking to pass the Small Business Jobs Survival Act (SBJSA), File#: Int 0402-2014 to Mayor Bill de Blasio. This petition cannot be sent through this site. Please copy and paste the following message into the contact form at http://www.nyc.gov/html/static/pages/officeofthemayor/contact.shtml. The largest employer of New York City residents are its 185,000 small businesses. 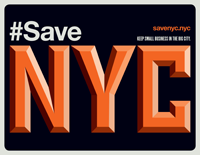 A majority of New Yorkers rely on steady jobs from local employers to survive the increasing cost of living. Yet the most secure jobs for low and middle income New Yorkers are being lost every day as long established core businesses are forced to close when their leases expire. New York City faces a jobs crisis that must be addressed immediately as our job creators fight for their livelihood. Exorbitant rent increases and no rights to negotiate fair lease terms with their landlords are driving our local economies into the ground. I believe a real solution has been presented that will give our local entrepreneurs — in storefronts, manufacturing, not-for-profit organizations, performing arts and theater groups, art spaces and studios, recording and rehearsal studios, retail and service businesses, professional medical offices, commercial tenants — the single most powerful tool to stay in business: equal rights in commercial lease renewal negotiation. If our small businesses face a crisis, their employees face a crisis, and that means we all face it. Give small business owners rights, so that their employees can have stability and our economy can continue to flourish. I am calling on you, New York City Council Speaker Corey Johnson, and all New York City Council Members, to unequivocally support the Small Business Jobs Survival Act (File #: Int 0402-2014) in its current form, the only real solution to ensure we are saving and protecting all of our small business jobs and in turn, the local economy. A 10 year minimum lease with the right to renewal, so they can plan for the future of their business, continue to employ staff, and provide their service to the community. Equal negotiation terms during the lease renewal process with recourse to binding arbitration by a 3rd party if fair terms can’t be agreed upon. Restrictions to prevent landlords from passing their property taxes on to small business owners. An end to rent-gouging, illegal extortion of unscrupulous landlords, and unconscionably high rent increases that affect ALL businesses. In addition, I strongly support a Commercial Vacancy Tax to penalize and dis-incentivize landlords from leaving storefronts empty, sometimes for years, creating high-rent blight and deadening our streetscapes. You can–and should–fight for this measure in Albany. On behalf of NYC’s single largest employer and revenue generator for our neighborhoods, we ask that you do the right thing for your city and local communities. Please support the Small Business Jobs Survival Act and fight for a Commercial Vacancy Tax.